Did you know that Christmas is only ten shopping days away? 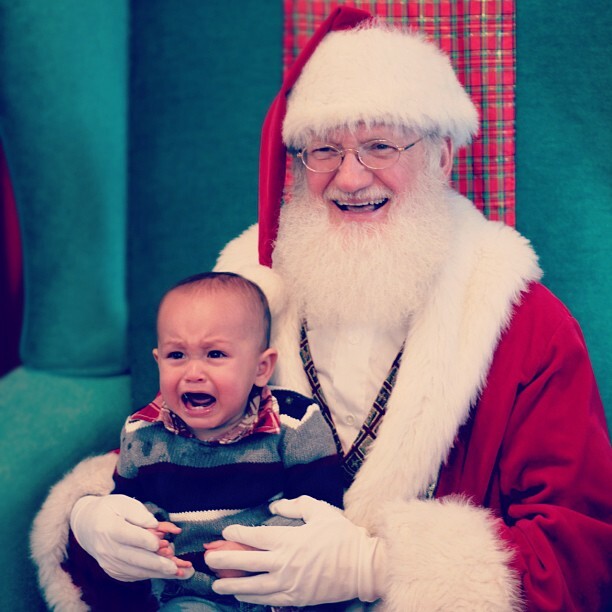 This image of Jude with Santa shows how I feel about that: I haven't bought a single present. No, not one. Who else is a big time slacker? I see you there with your hand meekly raised, AND I know your heart quickened when you realized that there isn't much shopping time left. Don't worry. I knew there'd be a lot of you last minute shoppers (we like to live life on the edge!) so that's why I put together this mega gift list compete with some last minute shipping times for you. You are welcome. Manic Trout: fashion forward and fun jewelry handmade in Austin, Texas7. Stegosaurus bracelet | 8. wire bling ring | 9. seahorse statement necklaceDiscount code: 15% off with adoredaustin until 12/31Ship times: Order by Monday, December 19th to guarantee Christmas delivery. Wild Gems: rare gem jewelry, elegantly designed10. peridot pear earrings | 11. stackable rings | 12. citrine studs (my all time favorite)Ship times: Order by Wednesday, December 21st to guarantee Christmas delivery. Electric Frenchie*25. lavender tunic | 26. sparkly gold party dress (perfect for NYE) | 27. color block skirtDiscount: Dec. 15-19, 15% off with ADOREDFRENCHIEShip times: Order by next Monday, December 19th to guarantee Christmas delivery. *denotes imported products that may not necessarily fit into my ISWH guidelines. The image is now clickable so get your shop on!